Recipe from: Richard Simmons "The Today Show"
1. Dressing: Place all dressing ingredients in blender. Blend until well mixed; there will still be little pieces of onion. Pour into small saucepan. Heat gently, stirring. Do not boil. Let cool. Then chill. You should have about ¾ cup dressing. 2. In serving bowl combine all chopped and diced vegetables. Chill. Just before serving, add ¼ cup dressing to vegetables in bowl. Toss to combine. Taste and add more dressing if you like. Arrange each portion of salad in a beet on serving plate. Yummy! When I saw the picture I thought those were hollowed out yellow peppers as serving vessels, not beets. I don't know that I've ever seen a yellow beet. Anyway, this salad is on my "must try" list. Thanks! 1. I'm got a salad on tap for tomorrow..thank you and Richard! 6. 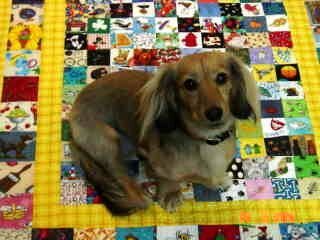 My condolances to Mr. Heart and Hands, A quilting journey...please know we'll return her just as soon as she's used ALL her fabric, scraps, ideas and dryer sheets!